“The Adventures of Arabella Ashby” series starts off with a bang in Arabella of Mars. The second book, Arabella and the Battle of Venus, was not as ‘romantic and dashing’ as the first. 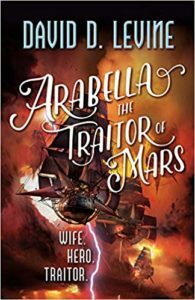 The third, Arabella the Traitor of Mars, is a good conclusion to Arabella’s story but it doesn’t have the spark of the first book. I mentally groaned when the book started with Arabella and Captain Singh on Earth but then Arabella, once again, needs to race to the other side of the solar system, in as short a time as possible. This time it’s not for her brother, or the love of her life, it’s to save the planet of her birth, Mars. When Arabella becomes aware of a planet wide threat to her beloved Mars, she immediately realizes where her loyalties lay and rushes to the defense of her homeworld. Once again she and her husband, Captain Singh, struggle against enormous odds, this time becoming traitors to the Crown in the process. Arabella continues to be brilliant. With the aid of clockwork automata, she creates daring plans and invents complex space combat maneuvers, navigating wooden sailing ships between planets on solar winds. She continues her engineering tinkering, designing improvements to machines and developing new automata. It felt like a lot of the same elements as the other two books. The stakes have gotten bigger but the path remains the same. All that aside, I did enjoy the book. I like Arabella as a character, a bit headstrong but also intelligent, creative, and highly capable in a crisis. The whole premise of Regency England in space with operatic battles between wooden sailing vessels continues to be pretty fun. I liked learning about Martians and filling out more of their world and society. I also liked the coming together of humans, Martians, and Venusians . The romance felt muted, in part due to Arabella and Captain Singh being separated for a time, but perhaps also because there was almost constant tension. Overall, it was an entertaining read and it has a satisfactory ending to the trilogy, even if it felt a little samey. At least, I assume it’s a trilogy as Arabella the Traitor of Mars has a nice epilogue that jumps forward several years, so you know what has happened to Arabella since the climax of the book. Share the post "Still has exciting steampunk aerial combat but doesn’t recapture the joy of the first book"
Reader, role-player, board-gamer, and baker who happens to be a mom that would like to travel and ride horses more. Found predominantly reading fantasy, sci-fi, children's, middle grade fiction, and YA in roughly that order, preferably with a cup of tea nearby. My daughter in 5th grade will occasionally be adding comments, as Ysakitty, to books she has read too. Am I cooling on Scalzi?